The Morton Arboretum in Lisle is a gorgeous and scenic place to hold your wedding ceremony and get some great outdoor photographs taken. With gorgeous paved garden paths and lush trails, you will be sure to have an unforgettable wedding and wedding photographs. The Morton Arboretum also boasts two gorgeous reception rooms (available December through March for Winter weddings) and a wonderful menu. Please call the Morton Arboretum at: 630-968-0074. if you are interested in having your wedding here as a permit is needed. 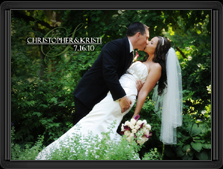 Kristi and Chris were married on July 16th 2010. There wedding reception was held at Abbington Distinctive Banquets on a beautiful July day. There ceremony and outdoor wedding photographs took place at the scenic Morton Arboretum in Lisle which makes for a gorgeous photographic backdrop on your wedding day no matter what the season. Their gorgeous reception at the Abbington was nothing short of breathtaking. From the table settings to the centerpieces to the gorgeous desserts and dishes, the wedding was picture perfect. Below are some photos from the wedding of Kristi and Chris. Thank you Kristi and Chris for allowing us to photograph your very special day! **Place your mouse on the corner of a page, click, hold and drag the cursor to turn page.